55 Aquarii, ADS 15971, BD−00°4365, HIP 110960.
ζ Aqr A: ζ2 Aquarii, Zeta2 Aquarii, HD 213052, HR 8559, SAO 146108.
ζ Aqr B: ζ1 Aquarii, Zeta1 Aquarii, HD 213051, HR 8558, SAO 146107. Zeta Aquarii (ζ Aquarii, ζ Aqr) is the Bayer designation for a triple star system; the central star of the "water jar" asterism in the equatorial constellation of Aquarius. The combined apparent visual magnitude of this system is 3.65, which is readily visible to the naked eye. Parallax measurements yield a distance estimate of around 92 light-years (28 parsecs) from Earth. In the catalogue of stars in the Calendarium of Al Achsasi Al Mouakket, this star was designated Achr al Achbiya (أجر ألأجبية - akhir al ahbiyah), which was translated into Latin as Postrema Tabernaculorum, meaning the end of luck of the homes (tents). This star, along with γ Aqr (Sadachbia), π Aqr (Seat) and η Aqr (Hydria), were al Aḣbiyah (الأخبية), the Tent. The binary was measured by William Herschel in 1779 however Christian Mayer, listed an earlier observation in his first double-star catalog in 1784 so its true discoverer is not clear. The two stars have an orbital period of about 587 years. The semimajor axis is 3.8 arcseconds and they have an orbital eccentricity of 0.40. The orbital plane is inclined by 138.2° to the line of sight. The brighter component, ζ Aquarii A (also called ζ2 Aquarii), is a yellow-white-hued F-type main sequence star with an apparent magnitude of +4.42. Its companion, ζ Aquarii B (also called ζ1 Aquarii), is a yellow-white-hued F-type subgiant with an apparent magnitude of +4.51. The fact that their brightness is so similar makes the pair easy to measure and resolve. Zeta Aquarii A is known to be an astrometric binary system, as it undergoes regular perturbations from its orbit. It has a 26-year orbital period and a semimajor axis of 0.11″. The secondary's mass is 0.6 M☉. Zeta Aquarii is currently a northern hemisphere object. In 2004 it was directly above the celestial equator, and before that it was located south of it. ^ a b c d Nicolet, B. (1978). "Photoelectric photometric Catalogue of homogeneous measurements in the UBV System". Astronomy and Astrophysics Supplement Series. 34: 1–49. Bibcode:1978A&AS...34....1N. ^ a b c Tokovinin, A.; et al. (December 2010), "High-Resolution Imaging at the SOAR Telescope", Publications of the Astronomical Society of the Pacific, 122 (898): 1483–1494, arXiv:1010.4176, Bibcode:2010PASP..122.1483T, doi:10.1086/657903. ^ Wilson, Ralph Elmer (1953), "General Catalogue of Stellar Radial Velocities", Washington, Washington: Carnegie Institution of Washington, Bibcode:1953GCRV..C......0W. ^ a b c Nordström, B.; et al. (May 2004), "The Geneva-Copenhagen survey of the Solar neighbourhood. Ages, metallicities, and kinematic properties of ˜14 000 F and G dwarfs", Astronomy and Astrophysics, 418 (3): 989–1019, arXiv:astro-ph/0405198, Bibcode:2004A&A...418..989N, doi:10.1051/0004-6361:20035959. ^ "Sixth Catalog of Orbits of Visual Binary Stars". United States Naval Observatory. Retrieved 14 June 2017. ^ a b c d e f Tokovinin, Andrei (2016). "The Triple System Zeta Aquarii". The Astrophysical Journal. 831 (2): 151. arXiv:1608.08564. Bibcode:2016ApJ...831..151T. doi:10.3847/0004-637X/831/2/151. ^ a b Bernacca, P. L.; Perinotto, M. (1970), "A catalogue of stellar rotational velocities", Contributi Osservatorio Astronomico di Padova in Asiago, 239 (1): 1, Bibcode:1970CoAsi.239....1B. 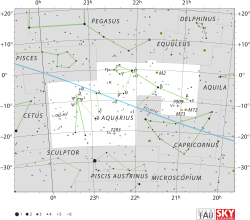 ^ Dibon-Smith, Richard, "z Aquarii", The Constellations Web Page, retrieved 2012-07-10. ^ Knobel, E. B. (June 1895), "Al Achsasi Al Mouakket, on a catalogue of stars in the Calendarium of Mohammad Al Achsasi Al Mouakket", Monthly Notices of the Royal Astronomical Society, 55 (8): 429, Bibcode:1895MNRAS..55..429K, doi:10.1093/mnras/55.8.429. ^ Davis Jr., G. A. (October 1944), "The Pronunciations, Derivations, and Meanings of a Selected List of Star Names", Popular Astronomy, 52 (3): 12, Bibcode:1944PA.....52....8D. ^ Allen, R. H. (1963), Star Names: Their Lore and Meaning (Reprint ed. ), New York: Dover Publications Inc, p. 52, ISBN 978-0-486-21079-7, retrieved 2010-12-12. ^ Olevic, D.; Cvetkovic, Z. (2004), "Orbits of 6 Binaries", Serbian Astronomical Journal, 168 (168): 25, Bibcode:2004SerAJ.168...25O, doi:10.2298/saj0468025o. Double Stars to Follow, Part IV: Zeta Aquarii and Mu Cygni. by Martin Gaskell, Prairie Astronomy Club Home Page. "This Month's Double Stars" by Richard Jaworski.